Looking for a Used QX50 in your area? 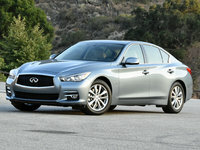 CarGurus has 4,231 nationwide QX50 listings starting at $10,457. If size was the problem for the Infiniti QX50, the solution is now at hand. For 2016, Infiniti’s sort-of crossover, sort-of wagon will grow in all dimensions, but most importantly in length. However, if the QX50’s issue was that it was too much of a car and not enough of a wagon, Infiniti is headed the wrong way, because this new 2016 QX50 will look even more like the Q50 sedan from which it was derived. The problem we refer to is sales. There haven’t been many, starting back when this vehicle was called the EX37, before Infiniti changed every vehicle name to a string starting with Q. The new 2016 QX50 will have much more rear legroom for passengers. The length of the new QX50 increases by 4.2 inches and the wheelbase by 3.2. Folks that have seen and sat in the new car say the extra length is all to be found behind the driver's and front passenger seats, where it was needed. This being a wagon or crossover of sorts, children may be involved in the vehicle’s mission. Not having to move up the front seats to carry them around will be welcome to owners. Infiniti says the increase in knee-room in back is 3.9 inches. This might be just the ticket to get shoppers to commit. Infiniti also increased the ground clearance of this sort-of crossover. However, with only 6.5 inches, the AWD QX50 has way less than vehicles like the Subaru Outback (with 8.7 inches), which are marketed as rough-and-ready soft-roaders that love to blast through snow. You may want to wait until the plows have made a pass before heading out in your QX50. Infiniti’s 3.7-liter V6 engine carries over for the 2016 QX50, as does the 7-speed automatic transmission with manual mode. The engine has 325 hp and 267 lb-ft of torque. There is certainly nothing wrong with that, as this non-turbo engine is responsive and powerful. The transmission is hassle free, unlike some double-clutch-type transmissions offered by its German competitors. For a wagon this size, that's a lot of power to put to use on the way to a pee-wee hockey game on a slippery winter morning. The 2016 QX50 is available with either rear- or all-wheel drive. The Infiniti system uses an electromagnetic clutch to determine where and when power is needed. Inside the 2016 Infiniti QX50, the design is all about the driver. Infiniti’s double-wave instrument panel will be familiar to anyone who has been in a Q50 or other Infiniti recently. The analog clock is still there, too. Thankfully the maple accent interior trim is optional, and aluminum is standard. The 7-inch color display is modern and has up-to-date features available such as real-time navigation and weather updates. Integrated Android and Apple functionality is not offered in this vehicle yet. Four packages can augment the two QX50 trims (Base and AWD). Infiniti’s Around-View is offered as part of the QX50 Premium Plus package. This system uses multiple cameras to give the driver a 360-degree view around the vehicle when backing up or parking. Other package options include Bose premium audio. Premium Plus adds DVD navigation and front and rear sonar. The Deluxe Touring Package increases tire diameter to 19 inches from 18. Beware such moves on any vehicle that will be driven in the snow-belt, though, as lower-profile, taller tires are not kind to ride comfort, nor are they as durable over potholes. This package also adds a power passenger seat up front and power fold-up rear seats. The important package for families, this being a station wagon, is the Technology Package. This is the one that adds active safety systems. Included are forward-collision prevention, intelligent brake assist, blind-spot monitoring, and lane-departure warning. Adaptive cruise control comes with this package as well. Look for the new 2016 QX50 to find a place on Infiniti dealer lots next to all the other cars and crossovers also starting with Q sometime in late 2015. 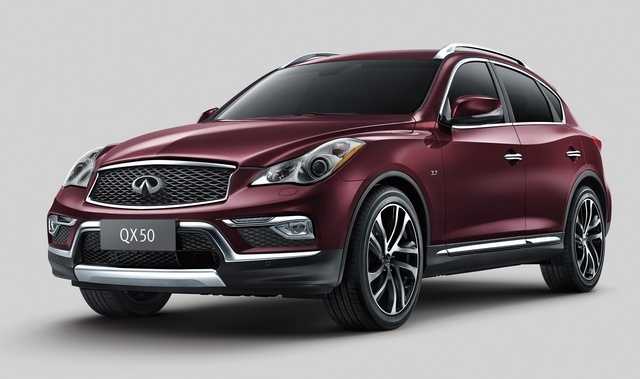 What's your take on the 2016 INFINITI QX50? Users ranked 2016 INFINITI QX50 against other cars which they drove/owned. Each ranking was based on 9 categories. Here is the summary of top rankings. Have you driven a 2016 INFINITI QX50?